During Guru Nanak Dev Ji's third missionary travels he traveled north into the Himalayas. Guru Ji visited Jawalamukhi, Kangra, Riwalsar, Kulu, and Tibet. 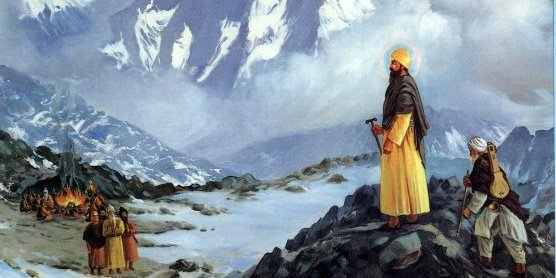 On Mount Sumayr Guru Sahib Ji met a large number of ascetics who were the hermits known as Siddhs. They had cut themselves off from the rest of the world and had grown very old and wise as they meditated and contemplated. Their leader was Gorakh Naath and they possessed great occult powers and performed many miracles. Although very young compared to the Siddhs they non the less recognised in Guru Ji the divine light and received him with great courtesy. The following is a composition called the Siddh Gosht or 'conversations with the Siddhas' that Guru Nanak Dev Ji wrote about his encounter with the Siddhs. It is a lengthy but masterful piece as Guru Sahib Ji answers the questions put to him by the Siddhs. thnx for sharing ae ji..